Denis Leamy is a famous Boherlahan man who even has the clubhouse in Dualla GAA pitch named in his honour. The son of Kevin and Anne, he grew up in the parish of Dualla and Boherlahan on a farm on the road from Dualla village to Moyglass. He was a famous professional rugby player. He was a back row forward who could play either flanker or at number 8 and occasionally played at inside centre. He ended his club rugby career for Munster in the Pro 12 and Heineken Cup, and internationally for Ireland. Denis Leamy's first sport was hurling and he initially dreamed of following in the footsteps of his heroes Nicky English or Pat Fox. He played for his local GAA side, Boherlahan-Dualla, where his early physical strength was noted. His initial introduction to rugby was somewhat accidental, and occurred when he accompanied his two brothers, Ed and Kev, along to a trial game with his local rugby club, Cashel RFC. Denis Leamy went to Rockwell college when he was 15. He played for the Rockwell Senior Cup Team for three years, the first of which he played at inside centre, before switching back to his more favoured back row position of number 8. After finishing school in Rockwell Denis Leamy, knowing the value of a good education, went to CIT to study Leisure Management. Declan Kidney saw his potential and he was awarded his first Munster cap at the age of 19. The highlights of Leamy's career with Munster are undoubtedly winning the Heineken Cup twice, first in 2006 and then again in 2008, scoring a try in the final. He was also the province's top try scorer in the 2006/2007 season with 7 tries. He captained Munster for part of the 2010/11 season in the absence of Paul O'Connell and was capped 145 times. 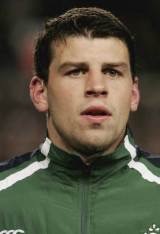 Denis Leamy was selected in the Ireland Squad in November 2004. He was capped 57 times. Denis Leamy announced his retirement from rugby on 22 May 2012, due to a hip injury suffered during the 2011–12 season. Tim Ryan, 6th class, Ballytarsna.